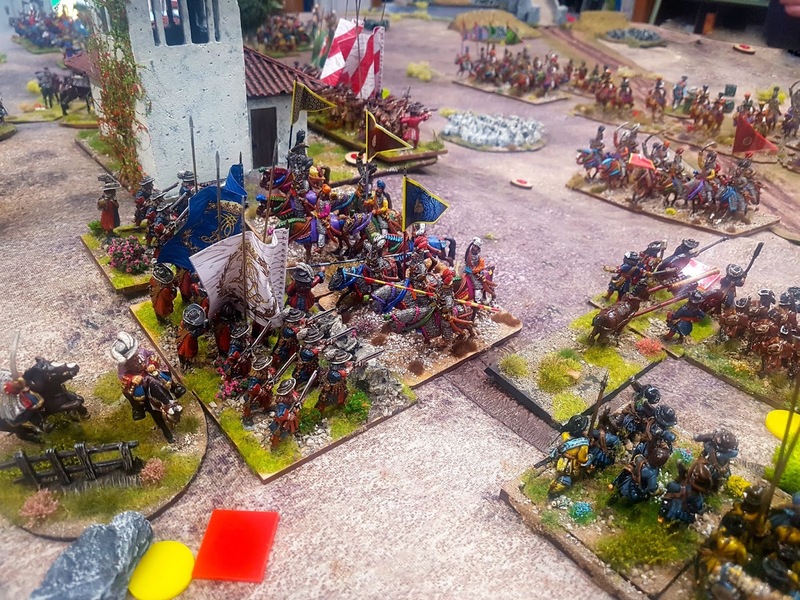 As detailed in the last post, yesterday's game was set during a forgotten and short lived imaginary period of hostilities between the Ottomans and the forces of Venice. The OoB and scenario notes etc are also on the last post. 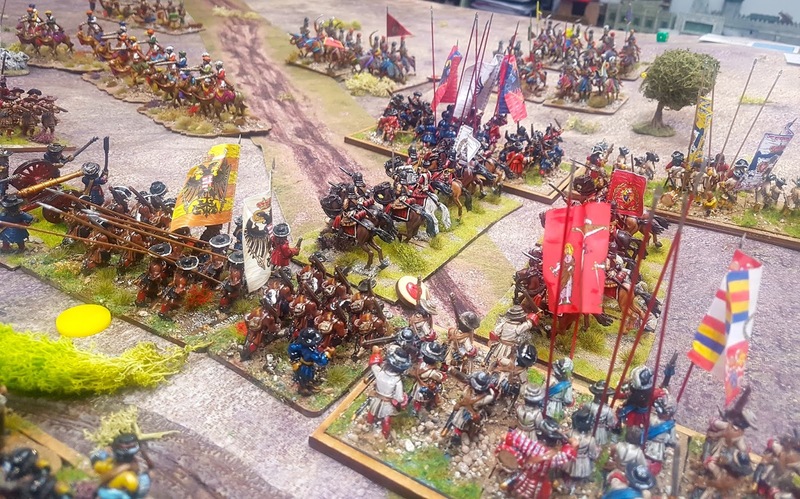 My Venetian, Papal, Savoyard et al forces were already veterans of one wargame, although they were pretty well duffed up by the French in that outing. The Ottomans were new and were bought en masse on a whim, as one does, in several job lots a couple of years ago. They are in need of rebasing, reorganising and tarting up to make them fit in but are still a viable force, especially when I added my Sikh Gorchara to play the role of Feudal Spahi. Steve and Conrad were the Ottomans while Paul and I (in a rare appearance) played the 'Allies'. 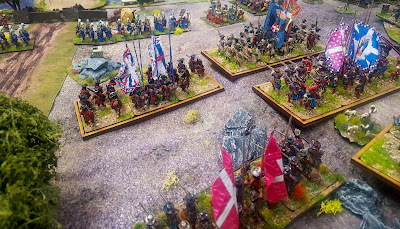 (They will be hereafter referred to as 'Allies' even though many of the troops were sent to aid the Venetians in exchange for gold rather than any reason to do with protecting Christendom, and those sent to support the Hapsburgs were there largely due to their Imperial 'obligations' - so they were hardly the best troops available given that their likelihood of ever returning home were pretty remote). The Turks deployed all their cavalry on their right with their Jannisaries in the centre and the crap on the left. 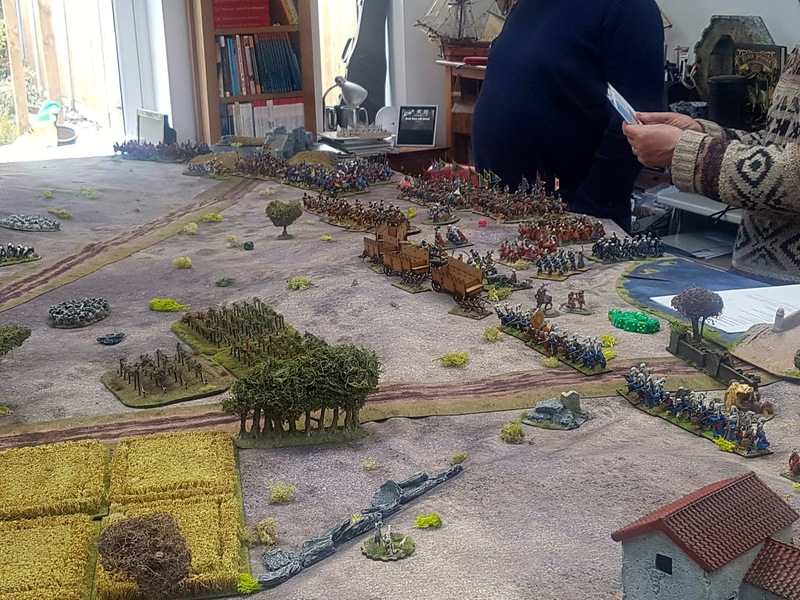 We deployed our strongest cavalry on our left where we guessed they'd be facing the enemy cavalry, the bulk of the foot and the remaining horse in the centre and a brigade of foot and some dragoons on the right to attack if possible but otherwise take advantage of the vineyards and olive groves to slow the enemy down. The river by the way was impassable except at the two bridges. The 'Allies' had to attack and smash through the Turks in order to leave over either of the two bridges and relieve their beleaguered comrades. The Ottoman centre was thinly held by cannon and Janissaries. I ordered our two dragoon regiments to advance and capture the village and surrounding orchards and vineyards. In the centre Paul's mixed brigade of Papal, Venetian and various German units blundered backwards off the table in the first turn, scuppering our plan for an all out advance in the centre. 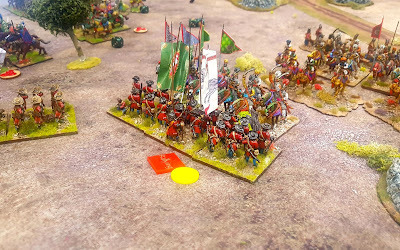 This meant our cavalry in the centre were forced to stand and await the return of the infantry or face being shot to pieces by the Ottoman artillery if they advance unsupported. Paul's Celle/Hanoverian brigade quickly to the hill and church of St Agetha but Steve's (probably anachronistic) camel gunners did a good job disordering the lead units. 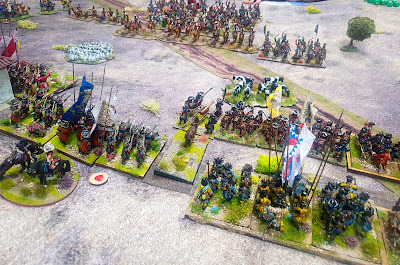 Indeed the unit seen above in yellow was to break early in the battle. To the left of the church a disordered battalion of Germans were charged by a unit of Spahis. Although the later were disordered during closing fire they won the melee and forced the Germans back. The Spahi wisely withdrew to rally. 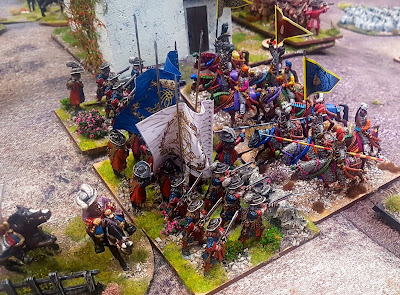 My Sikh Wars Gorchara and camel gunners doing sterling service in the Ottoman army, the former as Feudal Spahis. On the right my Savoyard brigade made slow progress towards the village and the Ottoman troops beyond. Conrad's irregulars moved around the far end of the village and did force one of my (Venetian) dragoon units to evade, but they were never in any danger. The aforesaid irregulars. 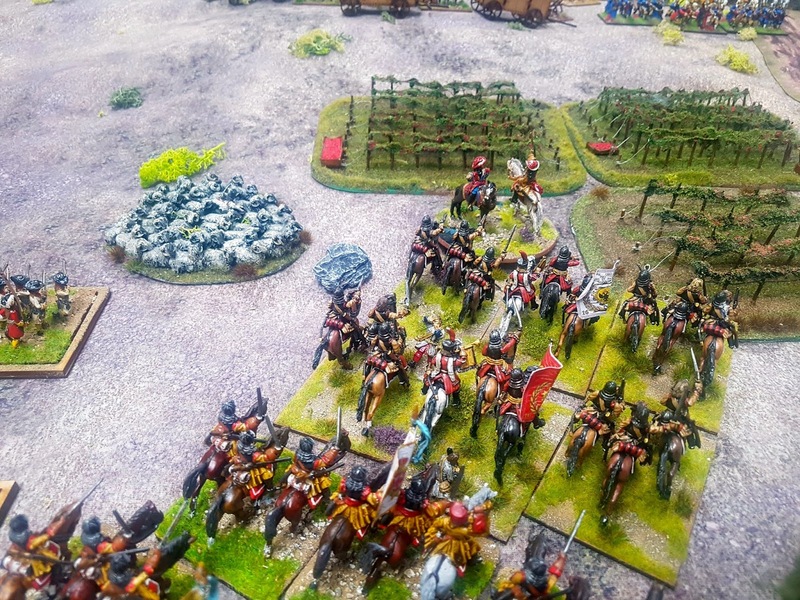 Thankfully I beat them to the village with my Savoyard dragoons. 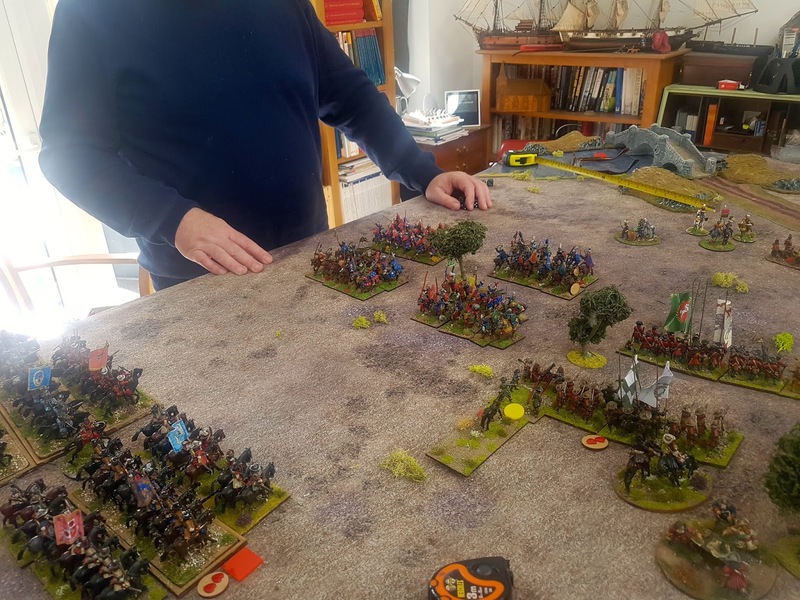 Steve had ALL the Ottoman cavalry and was pressing forward around the exposed flank of the Germans on the hill. Paul's cavalry were hampered by having a poor commander (a 6), having a card played on them which meant their orders went astray for 1D3 turns (it was 3 of course), and then the commander was randomly killed with a lucky shot! Early in the game one of Conrad's batteries threw a double 1, destroying one of his cannon. In my next turn I did the same, so serves me right for feeling smug! I think the rules say that on a double 1 the entire battery is out of action but I prefer our option as the gunners were much more professional than in the early period covered by the rules. Back on the right the Savoy brigade was closing on the Janissaries and Irregular musketeers, all the while taking fire from the enemy cannon. 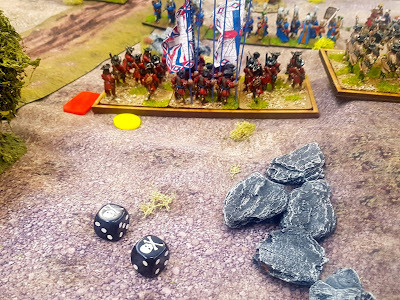 The latter gave the regiment at the bottom of the picture such a pounding that eventually they broke! Paul clearly wondering what I was getting up to on my flank. Seen from the behind the Ottoman centre, the German infantry on the hill look under pressure. 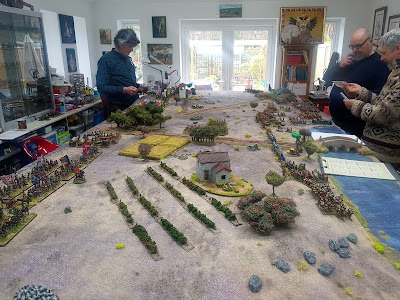 Thankfully the brigade which had blundered off the table returned and filled the big gap in our centre. Conrad's Jannisaries trading shots with the Savoyard infantry. 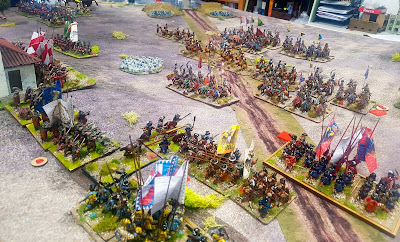 A moment's breathing space in our centre as the brigade of Venetian, Austrians, Bavarians et al advance. 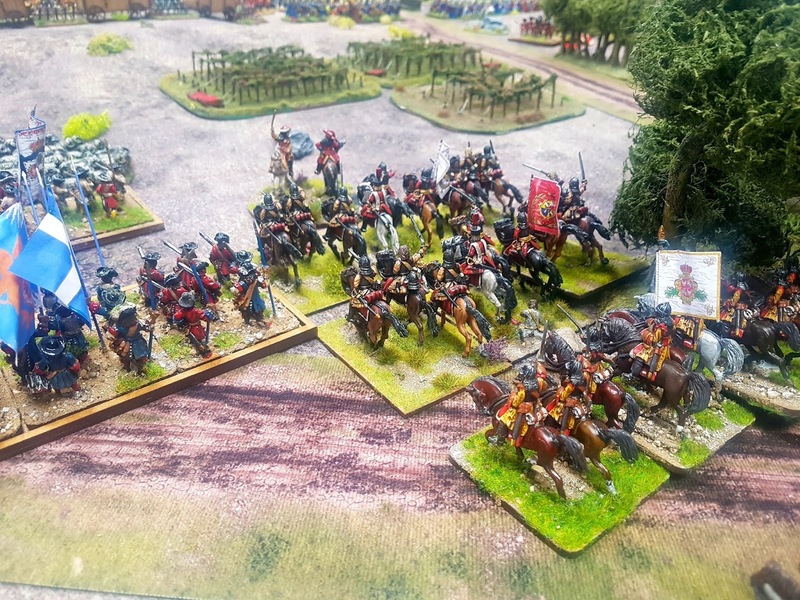 My cuirassiers were wasted where they were but I was unable to get them moving. 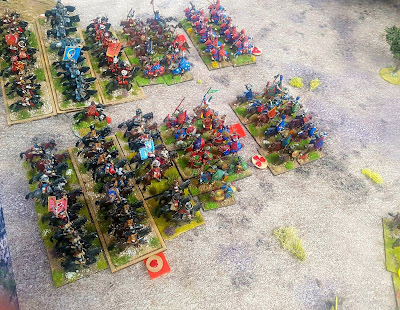 Steve's Spahi smashed into Paul's cavalry, who did well disordering both leading units with their pistols. Sadly it was not enough and both of Paul's regiments were forced back. 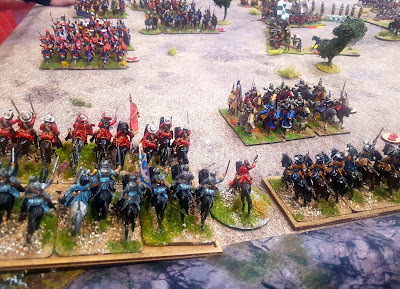 My cuirassiers finally got moving but then blundered in completely in the wrong direction! The central brigade beat off one Ottoman attack and advanced. 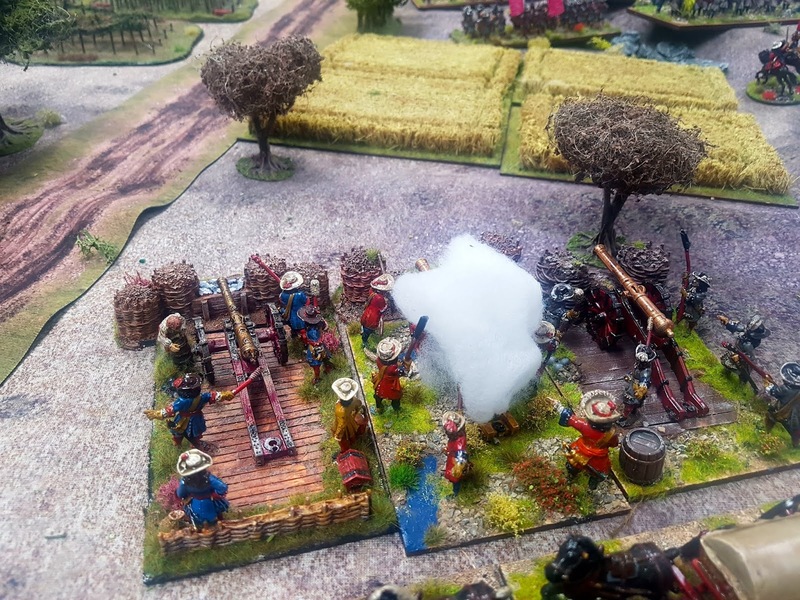 The continuing exchange fire on our right was going nowhere, except that I was taking more casualties than I was dishing out. The Guards were close to becoming shaken and the Redding Swiss battalion on the left was taking a battering. The Redding battalion were disordered, hit by cannon fire and took three excess casualties. A break test was required and passed as I threw a double six! 12 - 5 = 7 Stand! 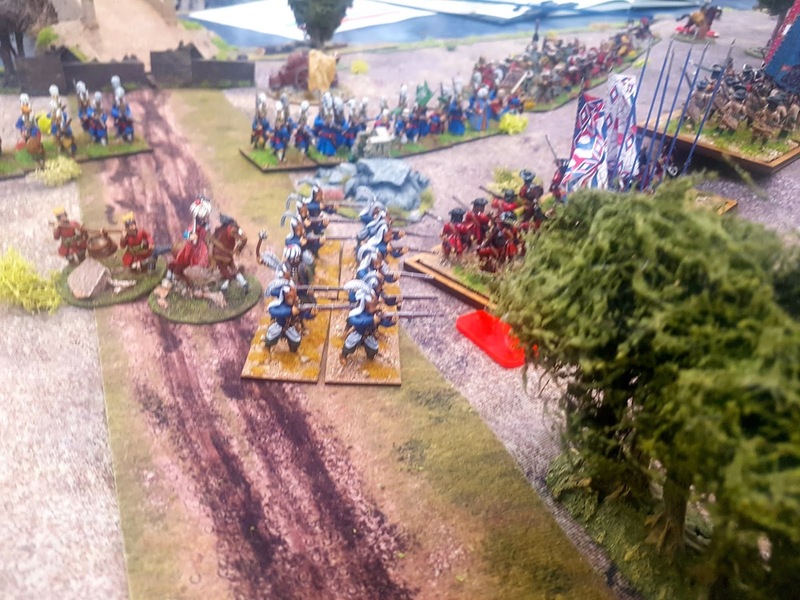 That was a very provident result as the Guards became shaken in the following turn, but by playing a card I'd been holding, was able to rally them off, thus saving the brigade from breaking. Conrad's Jannisaries hit the Swiss and pushed them back! A unit of Feudal Spahis crashing into Paul's infantry, first pushing them back. The Spahis made a sweeping advance and hit the German's again, this time riding them down. The battlefield seen from the Ottoman left. 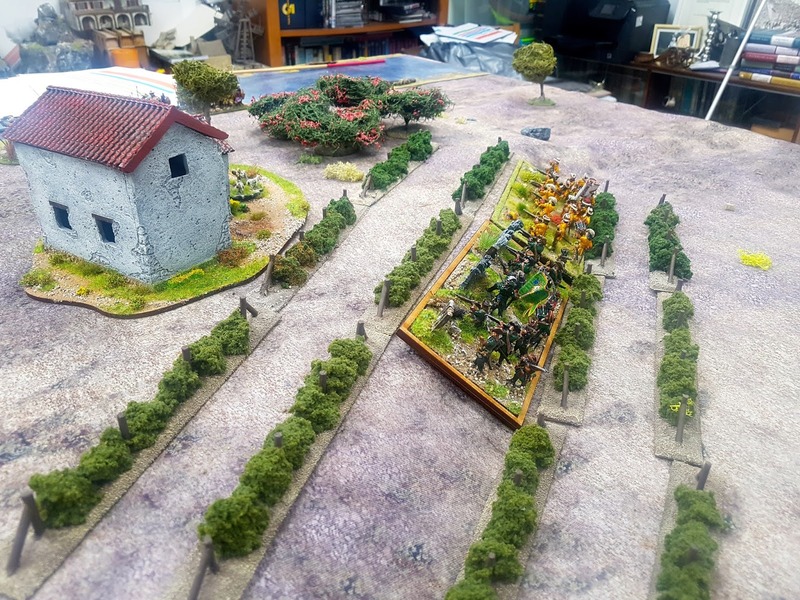 Another Hanoverian battalion was hit by Spahi but held. Delayed further by my commander's horse being killed under him, I swung two squadrons of cuirassiers round to the left while the other two covered the flank of the Savoy brigade. In another furious round of combat more of Paul's cuirassiers and horse were forced back off the table, resulting in the entire brigade of seven regiments becoming spent. 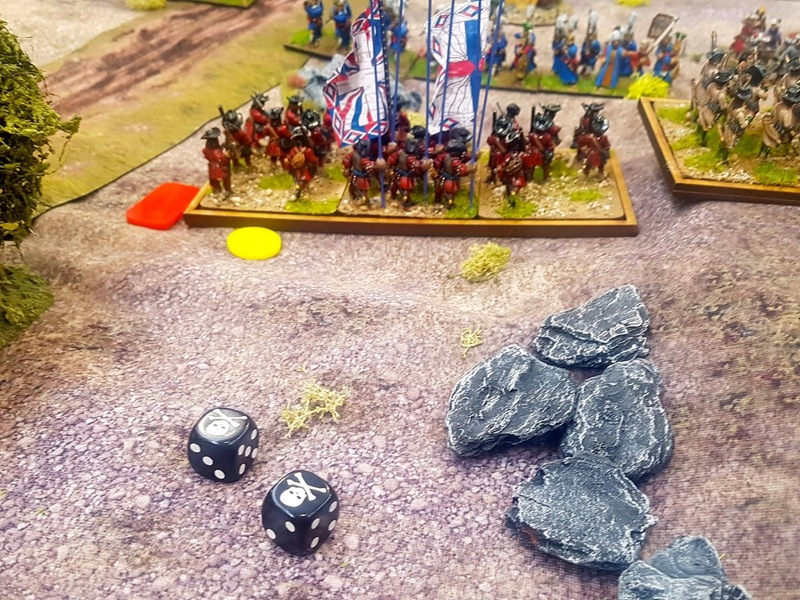 In the same turn my Savoy infantry brigade on the far right also finally went the same way and were forced to withdraw, a spent force. My Yellow Dragoons did however manage to ensure that all of Conrad's Balkan and Albanian irregulars also turned tail and fled. 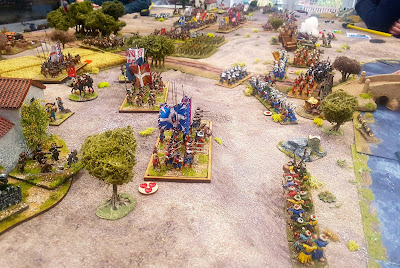 In a last desperate gamble I swung two cuirassier regiments between our two infantry lines in an attempt to hit Steve's Spahi in the flank. 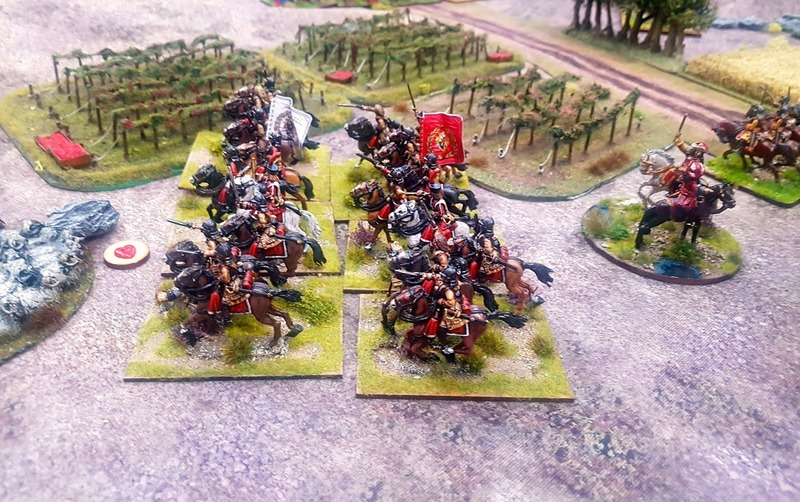 But it was too late as with both our flanks broken, as well as the German brigade on the church hill that also decided to reach break point, our army was well and truly beaten. The Ottoman's under Conrad and Steve had pulled off a resounding and pretty overwhelming victory. Our plan never got a chance to be executed thanks to the blunder in turn one. Some lucky random event cards also put more than odd spoke in the wheels, but for both sides. Again, using them was fun, at the same time very frustrating, and added another dimension to the game without spoiling it, Certainly Conrad was playing the cards like a demon, or was that a djin? 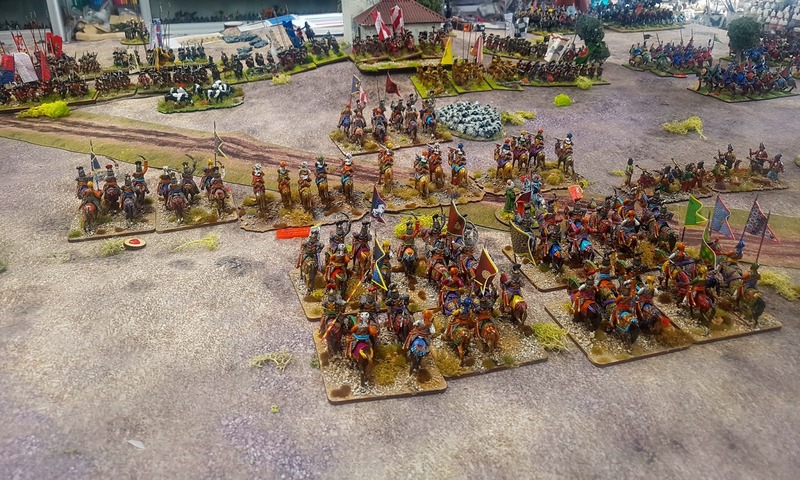 An unusual encounter, matching a pretty good but not too good European force against what I thought was a balanced and not overwhelming Ottoman army. The camel guns (anachronistic or no) were too effective but everything else appeared to work well. 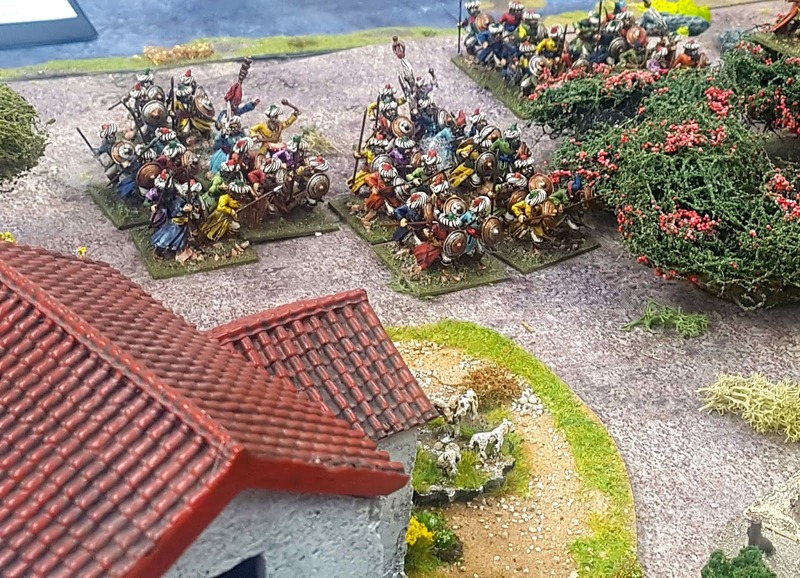 As usual the rules were very heavily tinkered with to attempt to reflect the last quarter or thereabouts of the 17th century. 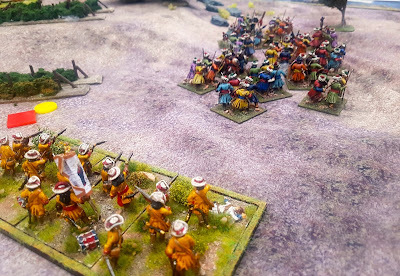 I would class all of us playing as experts in some aspects of the mid-late 17th century so we happily and more likely unconsciously played the 'period' rather than the rules. I have another game on Saturday so that is something to look forward to once I've decided what to put on. 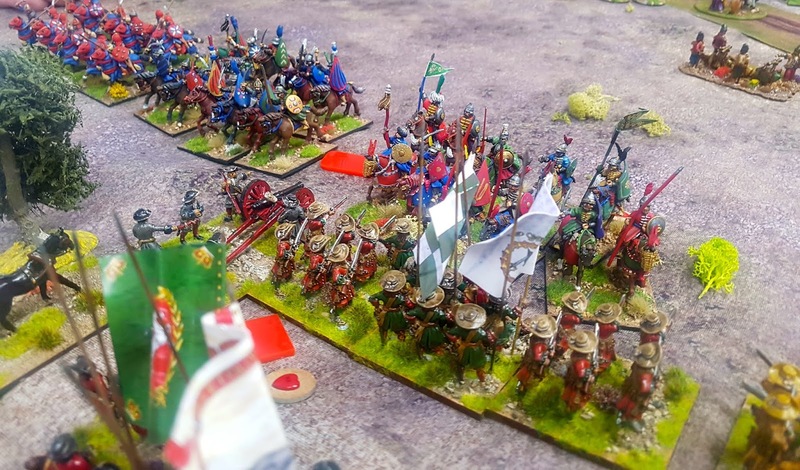 PS if anybody has any 28mm Ottomans that would do for the mid-17thC to late 18thC and are thinking of selling them, then please let me know. Beautiful table! 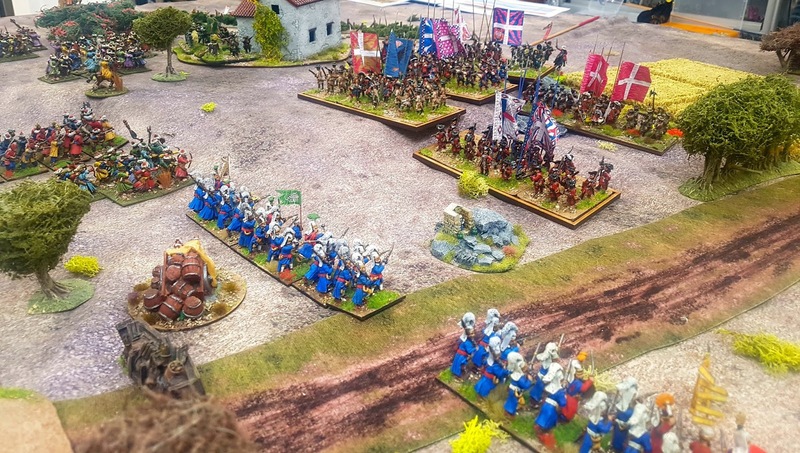 Gorgeous troops, fun game. 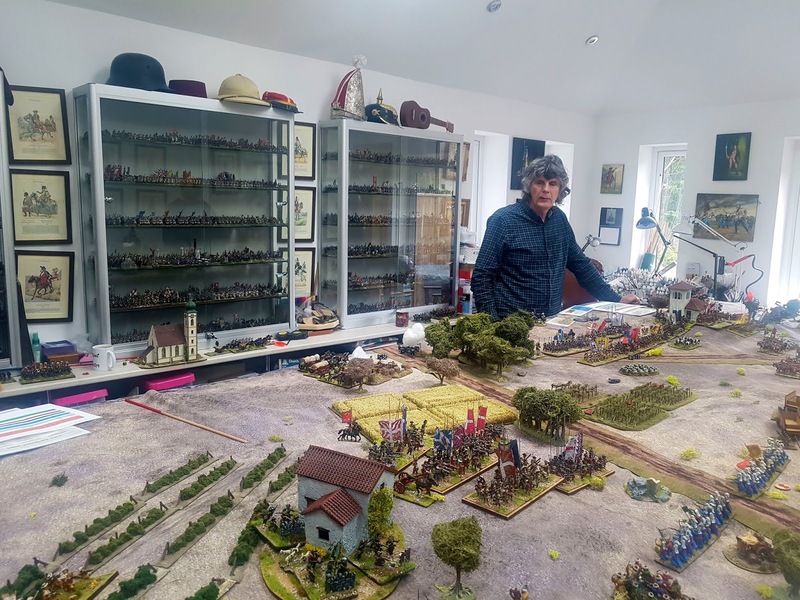 It just shows the best of wargaming! 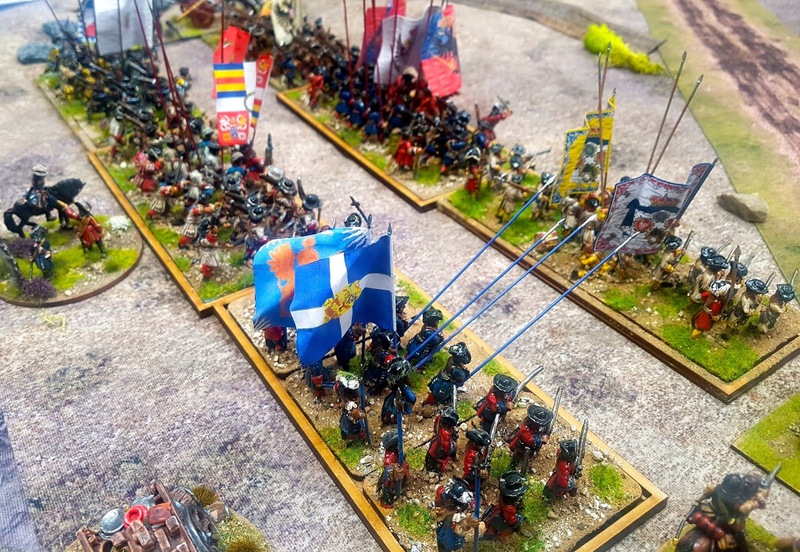 So glad to see this period played...superb units and flags all around! What a wonderfully colourful game. I like the vineyards too. I must sort something out like those for our Italian Wars games. 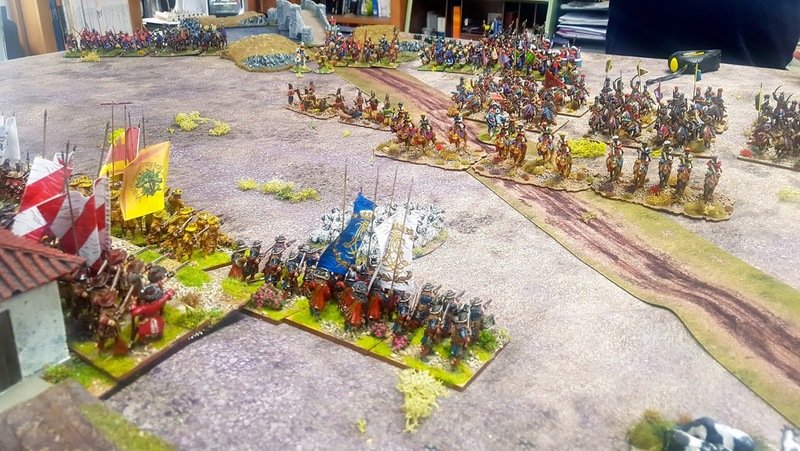 Really great looking colourfull armies. Nice battle too. Many thanks for your report! I love the period but never felt confident with P&S. To change rules was not to my taste or too much work.